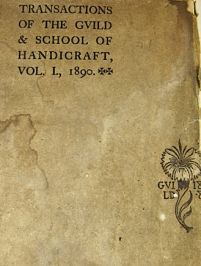 The Transactions, of which this was the only volume published, contains ‘A Short History of the Guild & School of Handicraft’ by C.R. Ashbee; and articles by William Holman Hunt, Lawrence Alma Tadema, Henry Holiday, W.B. Richmond, Thomas Stirling Lee, Edward Prioleau Warren, G.F. Watts, Walter Crane, and Giovanni Udine.